The AMRC Training Centre in Rotherham has helped the University of Sheffield win a national education award for its outstanding support in inspiring students to achieve their academic dreams and providing the best foundations for their future careers. Part of the University of Sheffield Advanced Manufacturing Research Centre (AMRC) with Boeing, the AMRC Training Centre is a £20.5m facility on the Advanced Manufacturing Park (AMP). Backed by a £9.2m government grant and funding from companies, the state of the art centre opened on the Waverley site last year. The focus is on 250 students aged from 16 upwards, taken on paid apprenticeships with opportunities to progress on to postgraduate courses, doctorates and MBA levels. Sponsoring companies range from global leaders such as Rolls-Royce and Tata Steel to local high-tech supply-chain companies. Winning the Widening Participation Initiative award at the Times Higher Education (THE) Awards 2014 reflects the exceptional achievements of the first full annual cohort of 250 Advanced Apprentices. Vice-Chancellor of the University of Sheffield, Professor Sir Keith Burnett, said: "I am thrilled that the work of the University of Sheffield and in particular our Advanced Manufacturing Research Training Centre on advanced vocational education has been acknowledged with this wonderful award. "Our apprentices show what is possible when universities and companies come together to address real skills needs in the context of world-class research." Alison Bettac, director of training at the AMRC Training Centre, added: "We are delighted to win the Widening Participation Initiative of the Year Award. "We believe we have created a blueprint for bridging the manufacturing skills gap and promoting social mobility at the same time. 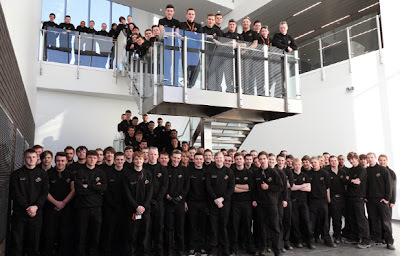 Many of the Training Centre apprentices would never have considered going to university. "In addition to getting a high-quality vocational education, skills and access to employment, they are also taking the first step on a road that could lead to undergraduate and post graduate degree courses, funded by their employers. "Our apprentices tell us they value being employed, instead of going direct to university and then struggling to find a job. They also say that if they do go on to study for a degree, having a ready-made understanding of how industry works gives them a sound foundation for their studies." The University of Sheffield also picked up awards at the event in London for its #weareinternational campaign in the International Strategy category and for supporting researchers through its Think Ahead scheme, a research-led framework for the professional development of researchers, supporting individual career ambitions in and beyond academia.